An artist's illustration of the interstellar object 'Oumuamua passing through the solar system in October 2017. Observations of 'Oumuamua indicate that it must be very elongated because of its dramatic variations in brightness as it tumbled through space. The history-making interstellar visitor 'Oumuamua is a relatively small and reflective object, a new study suggests. Astronomers spotted 'Oumuamua streaking through the inner solar system in October 2017 and quickly determined, based on its trajectory, that it's not from around here. No object from interstellar space had ever been confirmed in our solar system before. Astronomers also noticed that 'Oumuamua was displaying "nongravitational acceleration" — motion not attributable to the gravitational pull of the sun or any other solar system body. Such motion could be caused by "outgassing," strongly suggesting that 'Oumuamua is a comet rather than an asteroid, scientists argued in a study published this summer. One of the tools astronomers trained on 'Oumuamua's fleeing form was NASA's Spitzer Space Telescope, which is optimized to view the cosmos in infrared light — in other words, heat. Spitzer hunted for the interstellar object in November 2017, two months after the interloper's closest approach to the sun. 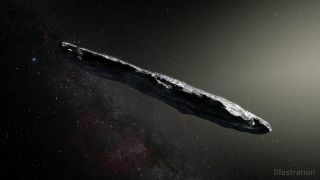 "'Oumuamua has been full of surprises from day one, so we were eager to see what Spitzer might show," David Trilling, a professor of astronomy at Northern Arizona University and the lead author of the new study, said in a statement. Spitzer came up empty, seeing no heat signature from 'Oumuamua. But that's a valuable result, study team members said, because it allows astronomers to place some limits on the object's size. These figures are consistent with other estimates, which generally hold that 'Oumuamua is less than 2,600 feet (800 m) in its longest dimension. The Spitzer non-detection also suggests that 'Oumuamua is perhaps 10 times more reflective than comets native to our solar system, study team members said. This may be a result of outgassing, which perhaps blasted dust off the object's surface, revealing bright ices beneath. Outgassing could have coated 'Oumuamua in brand-new shiny ices as well, according to the researchers. Unfortunately, speculation such as this may represent the final word on 'Oumuamua's nature; the object sped out of sight long ago. "Usually, if we get a measurement from a comet that's kind of weird, we go back and measure it again until we understand what we're seeing," study co-author Davide Farnocchia, of the Center for Near Earth Object Studies at NASA's Jet Propulsion Laboratory in Pasadena, California, said in the same statement. "But this one is gone forever; we probably know as much about it as we're ever going to know." The new study was published online Wednesday (Nov. 14) in The Astronomical Journal.